Have you ever wanted to give back to the community by volunteering but never knew where to start? Go to the Volunteer-a-Thon on February 1st from 8:30 am – 5:30 pm to start getting involved! 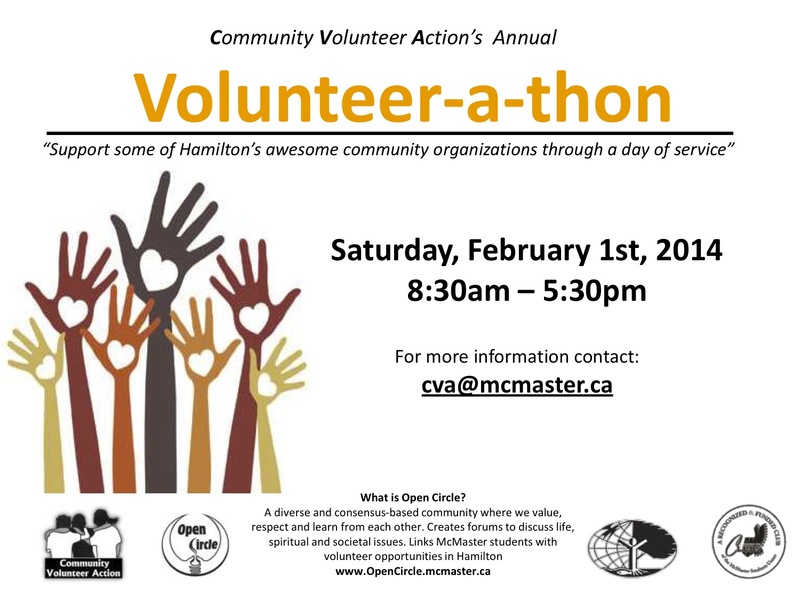 The Volunteer-a-Thon is being run by Open Circle and Community Volunteer Action, who are offering some much needed assistance to agencies faithfully serving the Hamilton community. Volunteers will have an opportunity to help with painting rooms, sorting paperwork or interacting with kids in sports or craft activities at the following agencies: Sugar Charity, YMCA and the Boys and Girls Clubs of Hamilton. The registration fee is only $5 which covers lunch. If you can’t make it to the Volunteer-a-Thon, there are other volunteer programs in Hamilton that need support on a more regular basis. One example is the LAF Afterschool Program@ Welcome Inn Community Centre, that’s looking for volunteers on Mondays, Tuesdays, or Thursdays from 3:00pm-5:30pm. You can browse these and other available weekly volunteer groups at www.OpenCircle.mcmaster.ca/volunteer. To sign up, please contact the group facilitator (information is listed on the website). Get out there and start volunteering!